If you're looking for a unique snack to have at your wedding, consider a popcorn bar! Other snacks? If you have other snacks and other hors d'oeuvres then you won't need as much popcorn since people will tend to spread out to all the snacks. How long to munch? The longer your guests have to wait, the more they will snack on. Also if you plan to keep the popcorn out all night, it provides a great snack to have while dancing the night away. Containers? How will your guests be treating themselves to your popcorn bar? Using larger bowls/containers will allow your guests to take more at one time, whether or not they consume it. If your bowls hold 3 cups, you may find yourself running short if you only allot for 1 cup per guest. Ultimately, the amount of popcorn will vary for every occasion. A good rule of thumb is most people, with other snacks available, will probably go through about 2-4 cups per person. Many couples will simply purchase a couple of flavors that match their tastes or are a little more conventional. Some try to use our large assortment of flavors as a way to match their wedding colors in their wedding. Either way, remember when ordering for a popcorn bar, you'll want some variety. Try to choose at least a variety in the type of popcorn for your popcorn bar. Not all guests enjoy (or can have for health reasons) candied popcorn and may prefer a traditional salted or savory (such as cheddar cheese). Need some help deciding? Order a sampler box and choose 9 flavors to try. When to order for your popcorn bar? We want to make sure you have the freshest popcorn available to your guests. We recommend placing your order at least 2 weeks prior to when you wish to receive it. During checkout we have a 'Delayed Shipping' option that allows you to select the date you wish to receive your popcorn. We recommend giving yourself a little cushion of time (extra 2 days) in case there are any shipping delays. Once you enter the date you want it, we will then calculate how long it will take to arrive and ship accordingly. And we won't process your credit card until it gets closer to the shipping date. This way you can get back to planning the rest of your wedding! 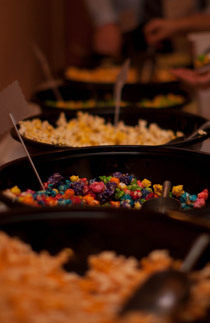 We have over 45 different flavors to make your wedding popcorn bar a huge hit. Whether you're looking for the perfect flavors or colors to match your wedding (or both!) we have the selection to make it work! Don't try to juggle planning when to order your popcorn to have it shipped the freshest. Using our Delayed Shipping option during checkout lets you order months in advance and we'll do the rest. We determine the shipping time and process your order in time for when you need it. Plus, we won't charge you until we get closer to your ship date, allowing you to us your money for other wedding deposits! Why use the Popcorn Wagon Frankenmuth for your wedding popcorn bar? We've been providing quality popcorn since 2001! We've helped hundreds of couples provide a great popcorn bar experience for their guests. Order a box of 9 flavors to sample. Our calculator will help you to configure our popcorn bar! Select flavors, increase/decrease bag sizes and quantities and see in real time the amount per person and the cost. Once you get it all figured out, one click will add it to your cart!